having a birthday on halloween means a party every year. whether we like it or not. i used to not like it cuz i thought only witches were born on halloween and that i was found somewhere on a rotted broom and left at my parents' doorstep. that's cuz other kids thought it was weird when i told them i was born on halloween. they would tell me i was really a witch, lying, or making it up for attention. i thought that was pretty dumb cuz i would more than likely pick christmas instead cuz it wasn't scary and would make toys all day as an elf, if i was gonna make it up. anywho, wanna know who else shares a booday/birthday with me? it's Karyn of Pint Sized Baker and Dieter's Downfall! 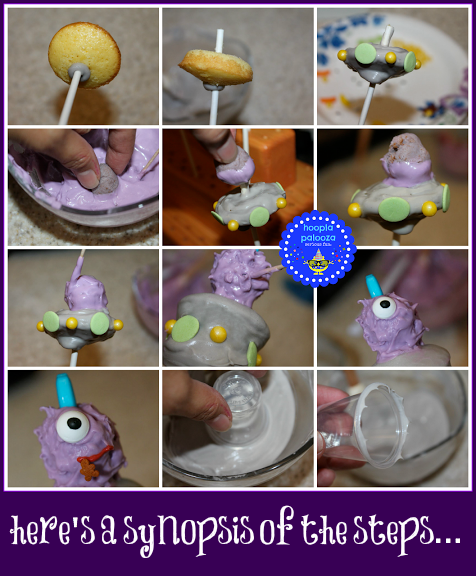 Karyn thought it would be a great idea to share a halloween booday together and so we made a special silly halloween treat to help celebrate the occasion. and seeing that we have our birthdays/booday on halloween, one may consider us strange, y'know, kinda like monsters or aliens or something. 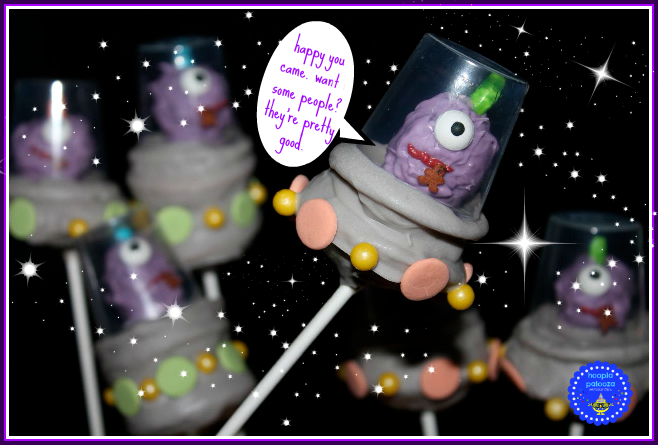 or perhaps even like the one-eyed one-horned flying purple people eaters!?!? 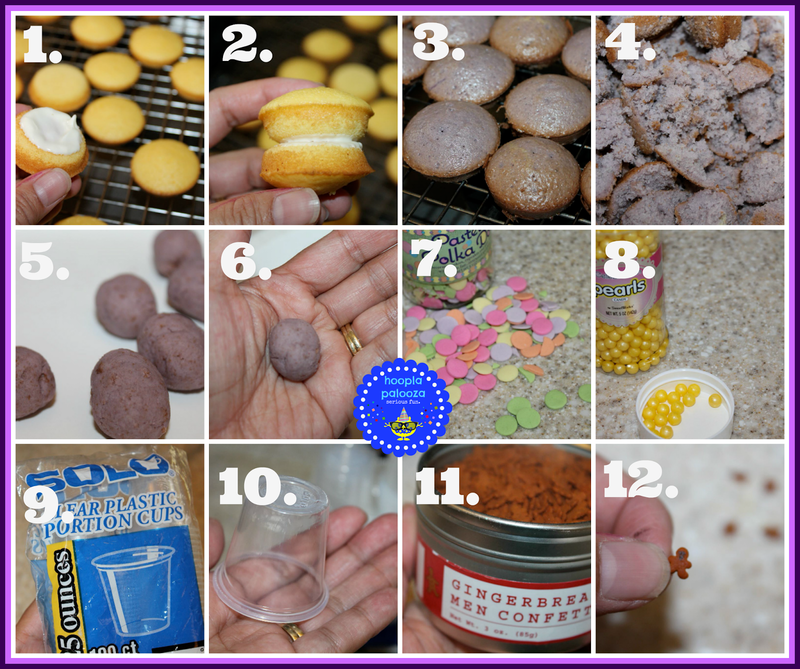 #1-i just made some vanilla cake shapes in a small whoopie pan. 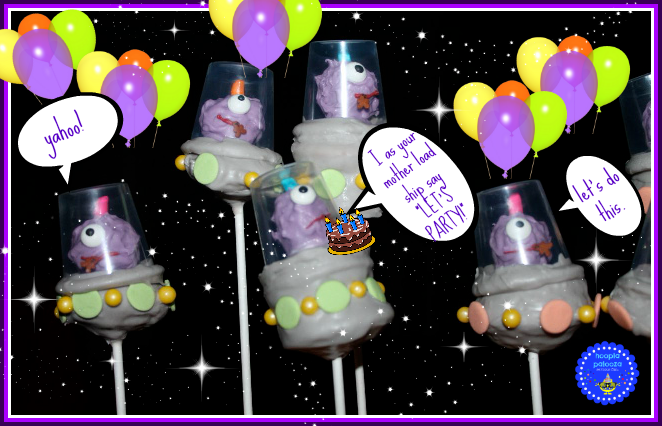 for some i glued them together with candy melt as shown in #2 but ended up using most of them alone as one little cake per cake pop. 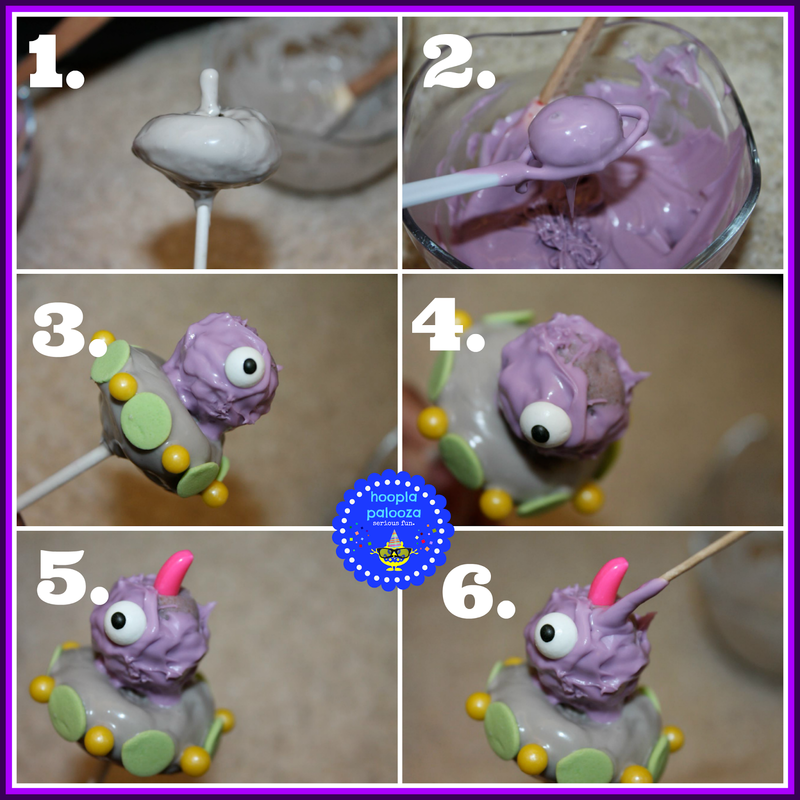 for #3-6 i colored some of the leftover batter purple and turned that into cake pop dough. as you can see, i made small circle/oval shaped out of the purple dough. none were perfect and none matched. cuz, since when do monsters match? on the teeny teeny tiny gingerbread man. it's basically a cake pop on top of a cake pop. how are they people eaters? oh my! that's crazy silly huh? 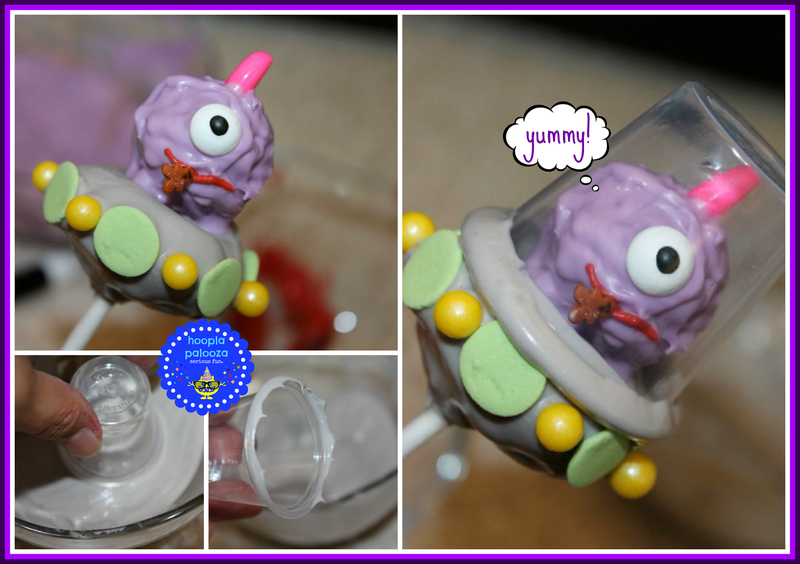 and dipping the shot glass in candy melt to finish the flying saucer is also in the cray cray category. thank goodness for toothpicks, a food crafter's best friend. looks like they are coming over to our halloween birthday party! but i think they are lost?!?! looks like people it is. what a fun way to spend a booday birthday! thanks so much for celebrating early with Karyn and one eye i! I love these guys! 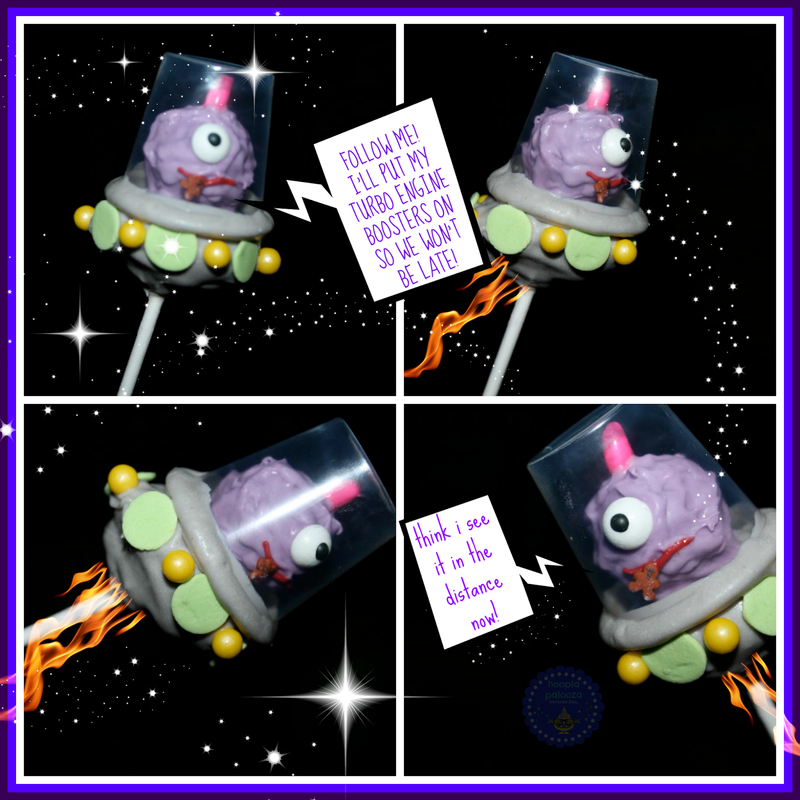 Their spaceships are so cute and wonderful! I hope you (we) have a great Birthday! me too Karyn and i can't think of a better cake pop buddy to share it with! :>D XO happy happy birthday booday to you too!!! These are great - they remind me of your super cute duck float donuts. I love double up desserts - cake pop plus vanilla cake/whoopie pie you could count me it. Hope you have a great birthday, my sister's birthday is Halloween as well and she has always loved it. These are super cute! For myself, I'd make them for my twin grandsons' booday in August! Whenever I saw "Happy Halloween Birthday" cards at the store I always wondered if I should envy or pity the recipients. Now I know! How fun to embrace it! My mother's birthday was 12-21 and she hated being handed ONE gift with a tag that said "Happy Birthday! Merry Christmas!" ooooo! I'd be FURIOUS! so funny& cute! thanks for sharing! This is just so fun!!! I love that song!!! So cute - those turned out awesome! Great idea. Thanks for sharing! These are awesome :) the shot glass idea is genius!!! That's adorable! I found your link at Thursday Favorite Things where I was linking too. I had to look. Love it! 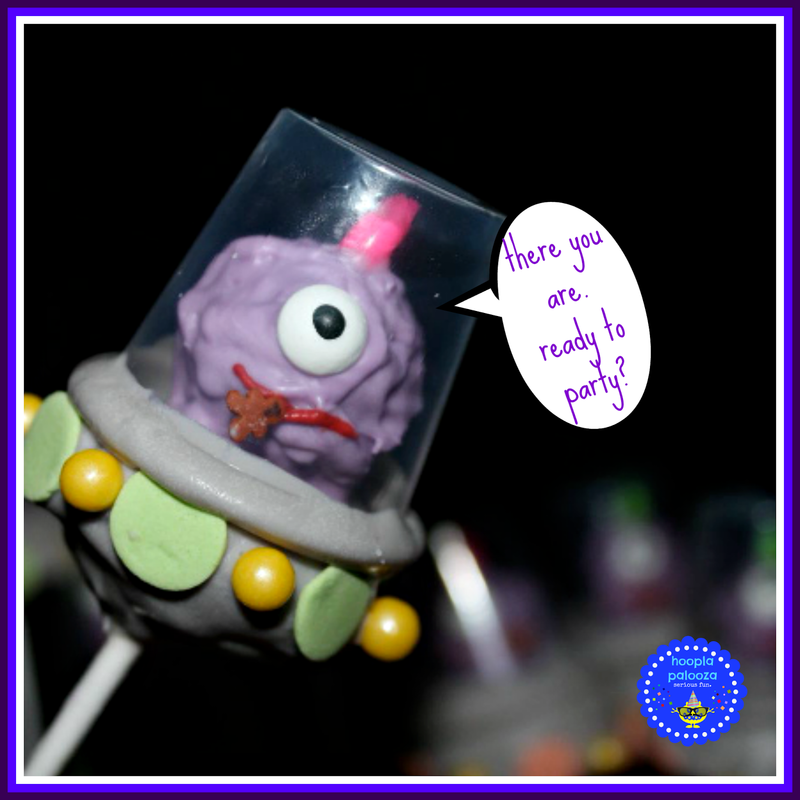 If you have time we would love for you to come link up at The Blog Strut! 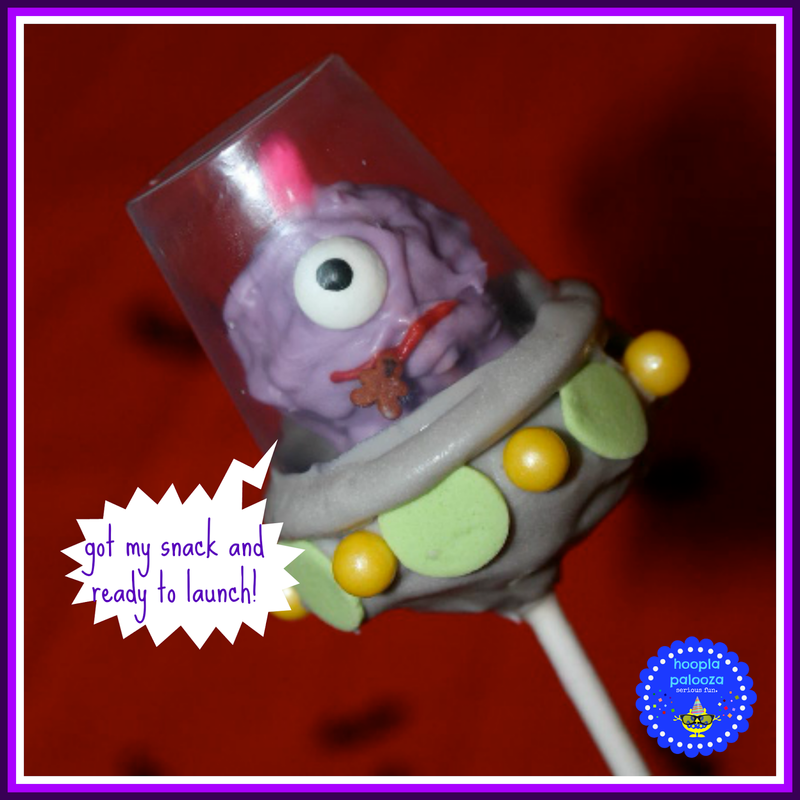 What a fun way to make a treat! Thanks for stopping by the Thursday Favorite Things Blog Hop I co-hosted! Adorable! So clever! and of course now I have the song in my head! Happy almost Birthday! So Fun! I don't know who wouldn't love these! So adorable, and unique! 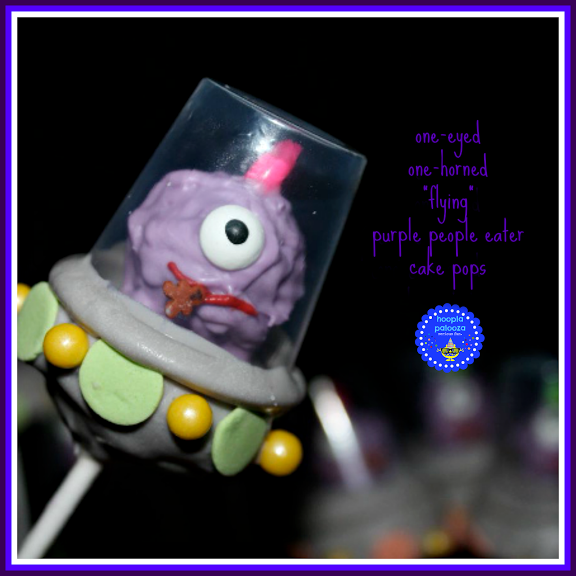 Love this flying saucer purple people eater, Pinning! Not only is he super cute but I just LOVE his name Purple People Eater. 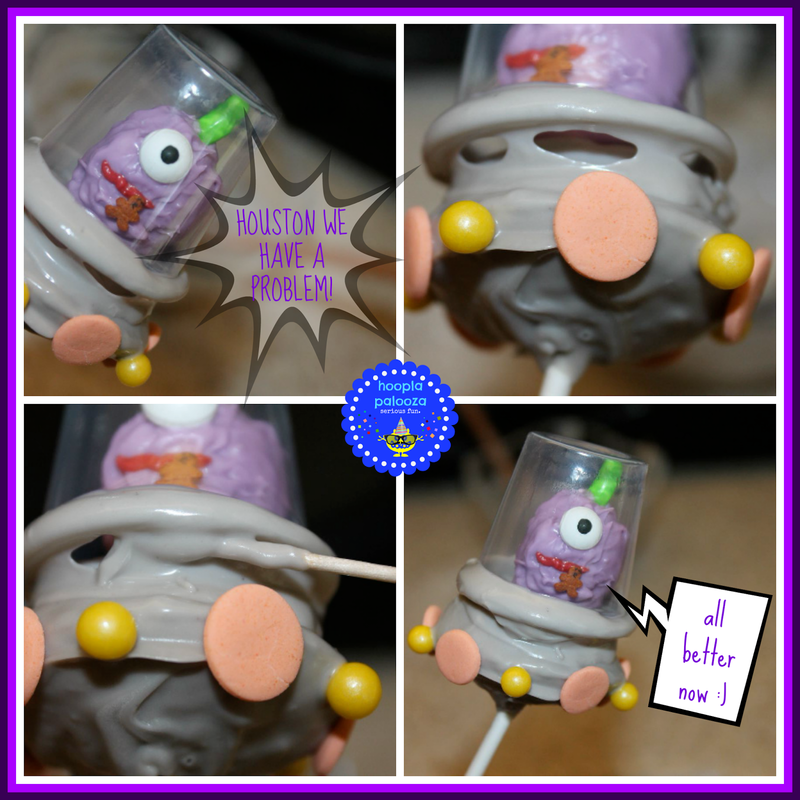 Thanks so much for sharing all your creativeness at We Made That Wednesday! Hi Lisa, this is so cute! I'm going to use it as a feature at my first linky party on Thursday. I didn't see an email to ask. please stop by and share something else if you have time. So creative!!! These are so cute. I love the story background you gave with the creation of these. This would make a cute kids book!! I'd make darn certain you copywrite this post from start to finish. This is such a cute idea. These images are totally awesome! oh YAY YAY YAY Krista! that song is an ear bug where it stays and stays in your head! good thing it's fun and silly! 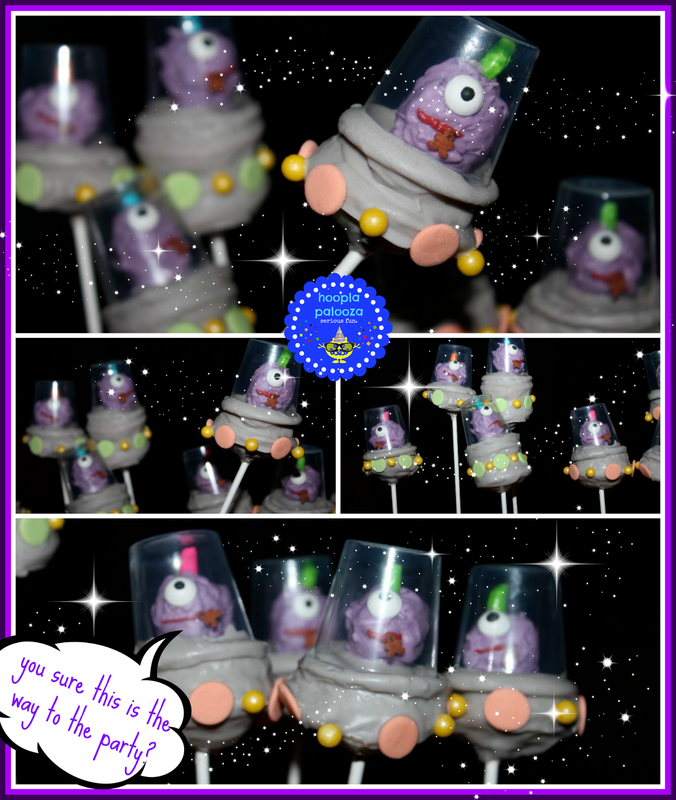 now when you sing the song these little guys will be buzzing in your head with their flying saucers :) thank you SOOO much for the feature! I am never failed to be amazed at your fun ideas! These are brilliant! I am useless with candy melts - they really don't like me!